Or to give it its fuller, more informative title: Bones, Rocks and Stars: The Science of When Things Happened. It is what it sounds like: a brief (under 200 pages, including the index) overview of dating technologies for a general audience: radio isotope dating, dendrochronology, Antarctic ice cores and so on. And I enjoyed it; Turney writes well, and he whizzes through the material leaving me feeling a bit better-informed without it being too much like hard work. And I think that’s pretty good going for what is a very technical subject. Interestingly he starts with what I don’t think of as a ‘scientific’ technique at all: his first example of dating is an attempt to fix a plausible date for King Arthur by looking at all the different manuscript evidence and trying to coordinate it. This carries all the usual problems of early medieval history: sparse evidence; second, third, fourth-hand accounts written many years after the event; confusions between different calendars and so on. I was slightly surprised by this way of starting the book, but actually it’s quite a good way into the subject. Without any of the technical stuff about radioactive isotopes it illustrates the same kind of problems you might have dating a fossil or anything else: trying to reconcile various kinds of data, each of which carries its own particular problems and sources of error. The choice of King Arthur, as opposed to any of the other myriad shadowy early medieval figures, is an indication of his popular instincts: he does like to use colourful examples. So we get the Turin Shroud, the Pyramids, Thera, Java Man. Which is fine by me. So brief, colourful, and not too technical overview of what is really a vast and complex subject, but if that’s what you’re looking for (and on the whole I think it was), it does a good job of it. » Pictures from Flickr. 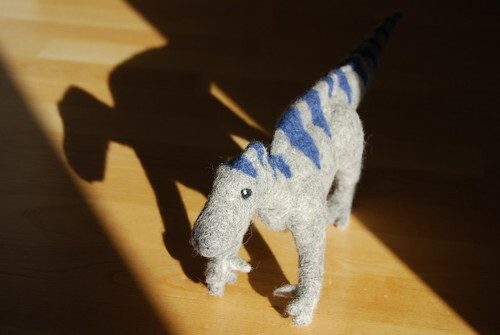 iggy6, the felt Iguanadon, is by feltfinland; the knitted ammonite and belemnite is by audreym.